A couple of weeks ago I undertook something that I thought I would never do. I entered a road cycling event. I’d been thinking about entering the audax for a number of weeks, but was put off by my perceived fitness level. It was only recently that I managed to cycle 15 miles, let alone any further. If you don’t challenge yourself, you won’t find your limits or improve. I put my name down for the event. What is an audax ? I’ll explain what an audax is for those that are wondering. 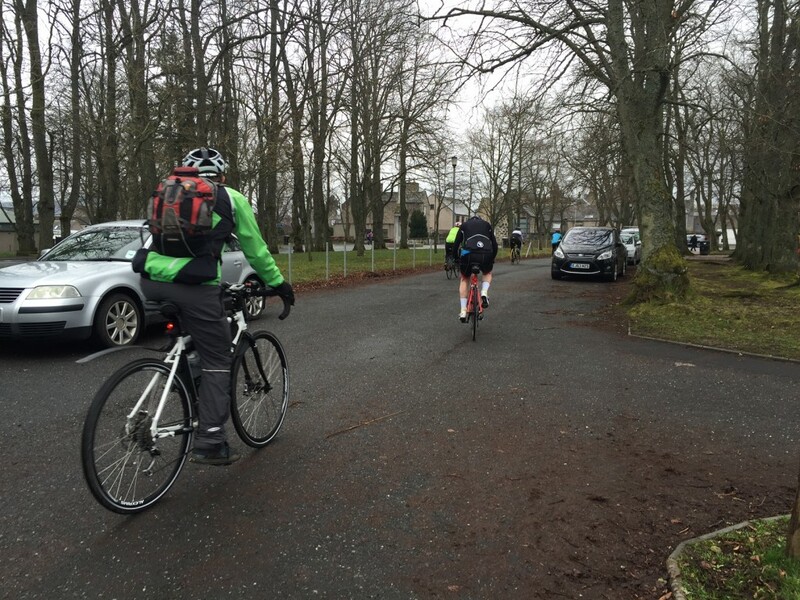 An audax is long distance route that must be completed within a set time. The distances are usually 100, 150, 200, 400 and 600 km. There are checkpoints at various stages along the routes where your entry card, or brevet card as its also known, is stamped. There may also be a set of questions. You’ll find the answer along the route if you look carefully. It’s more of a social cycling event. Definitely not a race unless you want to make it one. You can do it on any bike, but most people use road or touring bikes. 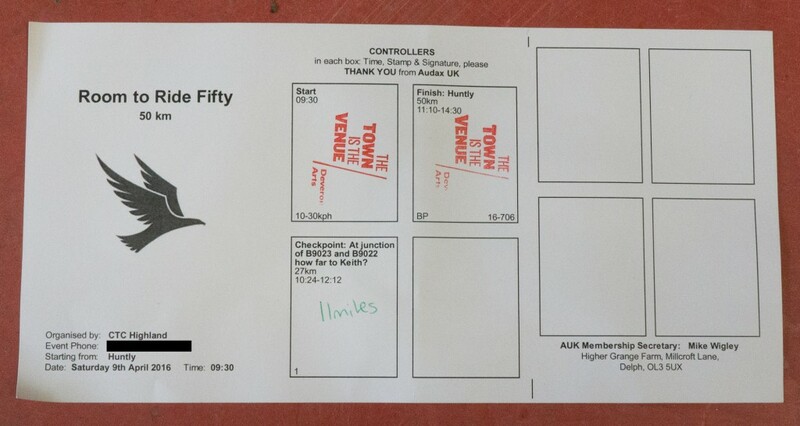 The Room to Ride audax has 3 distance options : 50km, 100km and 150km. I choose to enter the 50km / 30 mile event which has a time limit of 5 hours. It’s a route that takes you to Cornhill via the Aberchirder road and then back to Huntly via Glenbarry and Rothiemay. As with any outdoor event scheduled in April, the weather can be a hit or a miss. The week leading up to the audax was one of rain, rain and more rain. By Saturday morning there had been no let-up in the weather, and both my cycling buddies who committed to join me had pulled out for various reasons. At this point it would have been very easy just to quit. Indeed, I had all but spoken myself out of doing the event. I was convinced I need to ride in a group to be able to complete the distance, and to be there just in case something happened. At 9.15, I decide to give myself a shake. “Everything to gain and nothing to lose”, I thought. I jumped on my bike and rode to collect my brevet card. . The worst that could happen is that I had to call Doric Diversions HQ to come and rescue me. It’s fortunate I live 2 minutes from the start line. So I started at 9.30am with the rest of the 50km participants. Keeping up with the others, who were all obviously very fit road cyclist, was quite challenging to say the least. I didn’t keep up. But I did continue. Albeit at a more leisurely average pace of 11 mph. At first it was frustrating. Last summer, after my first operation, I’d managed to sustain an average of 15mph. However, at that point I was still riding on the back of my pre-operation fitness. Reminder #1, don’t compare myself to my pre-operation self. Problem solved. Once warmed up and spinning the pedals, I found it quite enjoyable. Just as in life, I had broken up the bigger goal, into several smaller goals. First was Kinnoir junction, then Bognie Brae, followed by Bridge of Marnoch, the Cornhill turn off and Cornill itself. If I managed to get that far I’d be happy. The ride up to Bognie Brae and then to bridge of Marnoch was a very pleasant one, even with the wind and rain. I can see me doing this route during the summer months. There is a great 30 mph+ section on the road into Cornhill. I stopped there for a quick food and water break and was soon on my way again. With a headwind and driving rain all the way back to Huntly it was a long slow grind. Reaching Glenbarry was the slowest part of the whole route. It honestly felt like I’d taken 2 hours to get there from Cornhill. 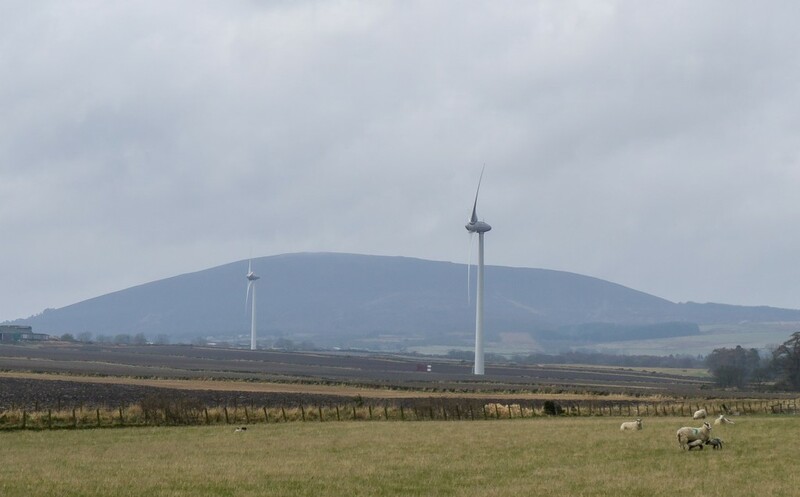 Thankfully, there are some splendid views along this section including wind turbines not too far from the road. The rain eased a little as I cycled past Rothiemay filling station. That’s when I remembered that there is a stone circle at Rothiemay and made a mental note to cycle there once the weather improves. It’s strange, I’ve been to the village dozens of times but never actually visited the stone circle. By the time I’d left Rothiemay and made my way up past the Haddoch, I was in survival mode. Simply pushing the pedals to keep moving forward, getting closer to my end goal. Even the downhill section past the Forestry Commission office was a struggle with the wind still billowing head on. After what seemed an inordinate length of time, I reached the Deveron bridge and began to feel that I could complete the route. With my enthusiasm rejuvenated I got a second wind and headed towards the school. Arriving at the finish I felt elated. Walking through the doors to the checkpoint, I was greeted warmly by Naomi Mason and Debbie Haefner who had organised and supported the event. Even better still, I looked at my watch and saw that I’d completed the 50km in 2 hours 50 minutes. Way beyond my expectations. There was a delicious spread of food waiting. Sandwiches, sausage rolls and more. I devoured a fair amount and washed it down with a mug of hot tea. Within a few minutes I began to feel normal again. Just as my legs started to seize up. Completing in the Audax was a major milestone for me. Each time I push myself, I’m able to progress to something a bit bigger for the next challenge. It also reminded me of the lessons learned in life. Sometimes it’s easy to forget these. And the other lesson I learned with every turn of the pedals ? Wear padded cycling shorts when doing a long distance road event. Normal underwear is jut too painful once you get beyond 10 miles ! So am I going to do another audax ? You bet I am. I’ve already started looking for events in Scotland later this year with a view to tackling a 100k event. A big thanks to Huntly and District Development Trust and Naomi Mason for organising the event. And to all those who encouraged and supported me to enter and complete the 50km. I’d also like congratulate all those who took part whatever distance category you entered. It’s a major achievement whether you did 50km, 100km or 150km. Well done, Dave. Went to York last weekend to see a friend, took the mountain bike. Ended up doing a 50km road ride on MTB tyres! The padded shorts were not enough! Ouch, that must have been tough. Absolutely well done David. An inspiration to everyone. ← Bush-biking ? What ?